Love Blueberry Simplex Diapers? Enter to win ONE! 8/4/17 FYSF, Win a Blueberry Simplex Cloth Diaper of Your Choice! Do you love entering our weekly cloth diaper giveaways? Yes? Well then you're in for a treat this week! One lucky Diaper Junction fan will receive their choice of any in stock Blueberry Simplex Cloth Diaper! What's so special about the Blueberry Simplex? Blueberry One Size Simplex diaper is made with a waterproof outer layer and 12 layers of 100% organic cotton twill fabric in the wet zone. The Organic Simplex diaper has pocket openings on both ends that allows you to increase the diaper's absorbency by adding extra inserts. This also enables any extra stuffed-in doubler or insert to agitate itself out in the wash. Half of the soaker pad is attached, while the other half also comes out through one of the pocket openings during the washing cycle. The result is a diaper that is thoroughly cleaned inside out and dries fast-either in the dryer or on the line. Enter to win this giveaway using the embedded Rafflecopter form below. This contest is open to the USA & Canada. Winner must be 18 yrs or older. 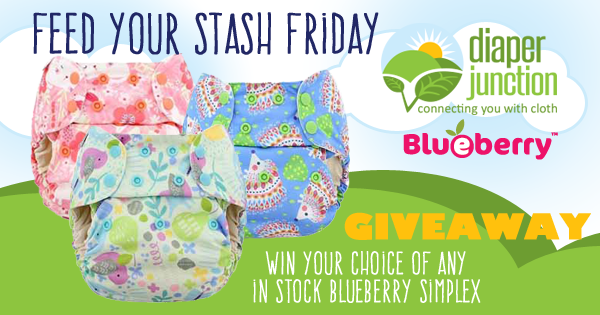 Winner will receive their choice of any in stock Blueberry Simplex diaper. Winner has 7 days to reply and claim their prize. I have been dying to try a blueberry diaper! Would love to try Blueberry! I've never tried this brand, Blueberry. Would love to give it a go though. Thanks for the giveaway. I haven't tried any Blueberry diapers ?? I haven't tried any Blueberry diapers, but want to so bad! I think I'd really like the Simplex. I have never tried one due to cost but I'd sure love too! OS Simplex are my favorite fit right now on my 3m old and I love their prints!! New to cloth and wanting to try all my options! These prints are too cute! I love Blueberry organics, wetbags, and trainers!! My son has 1 Blueberry Simplex. I really love the fit on him and we've never had any leaks with it. Would really love to add some more to our stash. These are one of my most favorite diaper brands/styles! They're not cheap, but so worth it. I would be THRILLED to win! I love Blueberry diapers! They make up about half of our stash. The fit is very trim. I have wanted to try blueberry for so long, but they're just always too pricey.?? I kept it on my wish list with baby 1 but it's too late, he's all potty trained. Expecting baby 2 though. So I guess it's still on my wish list. This will probably be my last baby so I've got my fingers crossed. Trying to build our stash for our little one arriving in December, this would be a great addition! We have tried bb pockets, OS simplex, and we love the wetbags and berry pods too! I haven't tried these yet, but oh that hedgehog diaper is so adorable! Never tried blueberry. Good luck everyone! I Would love the opportunity to win this diaper I am a new cloth diaper mama and I've heard such good things about this brand !! Yes please! I just started using Blueberry and need more! We have a one size aio in a print I just couldn't resist. I really like it. The price point is a little to high for me though unless I have stash cash to help a little but it is a wonderfully trim diaper! I have considered getting a sized simplex 2.0 as the price point is a little better! Thanks for the opportunity to win! I would love to try Blueberry diapers and I have been trying to build my stash up for my second baby coming in December! I loved trying Blueberry pockets, really would love to try Blueberry Simplex cause I'm in love with AIOs now! ?? I have tried the coveralls, capris & one simplex! I love my mediums! I'd like to try a one size for night time and trips. I cant wait to try blueberry! My first junction order is in the wash as we speak!! I have one Blueberry OS Simplex and always reach for it first! These are great. I have 1. I love the one size Organic Simplex. I can use it all night without a booster, but with a booster in the pocket. It is bulletproof. Would love one more! I would love to try something new! Always looking to try a new diaper and build up a good stash. I have never tried Blueberry but would love to try one out on my little boys!! We loved the newborn Simplex, now loving the one-size! It is so trim, fits really well, and is absorbent. We also love our Capri cover. Blueberry Simplex are my favorite! I have tried many brands, but these are the BEST! I haven't tried blueberry yet but I want too! The simplex looks very intriguing. Love Blueberry honestly one of my favorite brands ?? they have so many prints i absolutely adore and can't get enough of them! I'm excited to give this brand a try. I hope I win! I'm pretty sure I've only tried the Deluxe from Blueberry. The pocket style. Love blueberry diapers! I love the cute prints! I have quite a few Capri and coveralls covers and some pocket diapers I got in grab bags however I only have two simplex diapers that an aunt bought off my registry (thankfully) so I would love to have another! Hope to add another simplex to my stash! I haven't tried any yet! I've tried blueberry capris (love), blueberry pockets (ok), and blueberry inserts (hemp/microfiber combo - they were pretty good). I haven't tried Blueberry yet. I know it has a loyal following. I want to try them. The prints are beautiful. I love Blueberry covers, and would love to give a Simplex a try for our baby sitter stash! I have been using Simplex diapers since baby #2 who is now 6. They make up most of our stash now. Super absorbent and always a good fit on my kids. Perfect to be stuffed and used overnight, too. So far the only Blueberry diaper I've tried is a mini coveralls (cover). It's one of my favorite covers for my little one, but before long she'll outgrow it, and I'll have to hunt for new solutions like this! Love the prints they have. Happy Friday, I'd love the chance to win one of these diapers! I haven't tried one yet, but would love to! I love blueberry diapers! Thanks for the chance! Love BB simplex, have used them in NB and OS, and we have a few pockets too. They work well and fit my girl better than a couple other brands I've tried, so they're easily my favorite. We technically have enough diapers, but I would always take more in new fun prints in hopes of our stash lasting through a second kiddo! I love Blueberry prints, but I have never tried any of their diapers before (too pricey for me), so it would be wonderful to win one. Such an awesome giveaway! Blueberry has some adorable prints! We love them! I've never tried Blueberry before but I would love to! I have not tried a blueberry diaper. I am new to cloth diapering and would love to try a blueberry diaper. I haven't tried Blueberry yet but would like to. Haven't tried any Blueberry diapers but I am building my stash for our first due early October and definitely looking to add a few! I have a Fetching Friends Capri that I love and use all the time! Would love to try a Simplex! I haven't tried any blueberry products yet, but I would love to! Love our simplex! They make up the large majority of our stash! I've tried the Capri, pockets, and inserts, but not the simplex. We liked the Capri and the prints, so I'm sure the simplex is as awesome as others say. I've always wanted to try a simplex. I've heard so many wonderful reviews and comments on how well they fit & the quality. i'd love to try these on my baby girl. I haven't tried any Blueberry products yet but I really want to!! I have one Blueberry cover that's one of my favorites. Blueberry Sinplex are my fave aio's by far!! Would absolutely love to win one! I love my Blueberry Capris and Coveralls, & I would love to try the Simplex. Blueberry fits well & has the cutest prints ever! I've never tried blueberry diapers but would like to! We love our OS Simplex! We have LOVED blueberry diapers. Used newborn simplex exclusively for our newborn, switched to one size when she outgrew the fit on the newborn. We also use blueberry coveralls and capris. Love them all! I always buy them on sale, and REALLY stock up, so getting one of these newer super cute prints would be fun! Thank you for the opportunity! I have yet to try Blueberry products. They look great. I have tried the newborn covers, but I would love to try a one size one on my sons! We have Blueberry coveralls and pockets. Haven't yet tried any Blueberry products, but have heard great things!!! I've only tried one blueberry diaper, the AIO. I love diaper junction and miss the warehouse ?? I haven't tried any blueberry diapers yet unfortunately! I love the Blueberry diaper prints! So CUTE! I'd love to win one! We have tried the Blueberry one size pocket diaper for our first two girls. Blueberry makes the cutest prints! I only have one Blueberry Simplex bc of the price, but it's one of my favorites!! I would LOVE to win another :) I always tuck in the stay dry flap but the Birdseye is soooo soft and absorbent! !